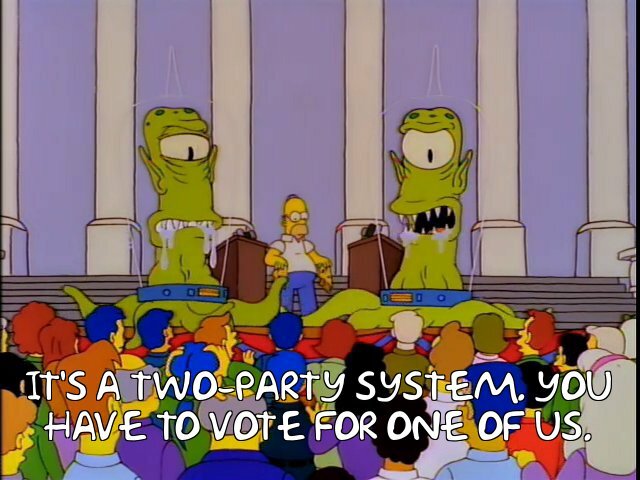 I can't say when the American notion of considering third-party votes wasted began, but I'm fairly certain that the first time I saw it expressed was in the 1996 Treehouse of Horror episode of The Simpsons. Since then, this sentiment has been augmented by the myth of Nader sucking away enough voters from Gore to tip the scales in Bush's favor. Today, this has culminated in the common plea from many to ensure the election of Hillary Clinton because of the desperate and unique existential threat that Donald Trump poses to this nation and, indeed, the world. I will start off with a very simple declaration: no vote is wasted. Democracy, even in the misshapen state you'll find in our presidential election process, depends on every vote that is cast. Thus, every vote is crucial. To claim that one's vote is wasted because it was cast for an extremely likely loser, but isn't wasted if it's cast for the loser with the most votes, is sheerly disingenuous. To claim that voting for a third party is not only a waste, but not even a political act, as Clay Shirky tendentiously argues, condescendingly strikes at the very freedom of voting one's preference, while neatly delivering a Catch-22 of American politics: voting for one of the two big parties strengthens the two-party system in this country; voting third-party doesn't strengthen third parties, which strengthens the two-party system in this country; not voting doesn't accomplish anything, which strengthens the two-party system in this country. It is an inescapably defeatist narrative, which is usually supplemented by a smug suggestion that the only way to change the process is from within. We can see how well efforts to make the Democratic Party more progressive rather than neoliberal, or to make the Republican Party more conservative rather than regressive and nativist, have fared over the last few decades. As for the myth of third-party candidates as spoilers, the basic premise is that third party voters somehow owe their vote to the big party that is in some way closer to their views. This is rank arrogation. You may feel that third party voters are misinformed, and perhaps misguided. You might even be right. But that doesn't make them any different than most voters for either big party; Shirky goes out of his way to impugn the motivations of third-party voters without ever questioning those of Democratic and Republican voters. Whoever we vote for will probably not accomplish what we want them to accomplish. Does that mean that our vote was wasted? The fact is that this point can be made persuasively, as John Halle and Noam Chomsky have done already. In general, we would be better served by cogent points and dialogue, rather than sententious declarations, if not outright accusations that someone is voting wrong (or, worse, a direct appeal to fear, which is the backbone of the Trump campaign, and also informs many of my friends' appeals to vote for Clinton, as they are terrified —with good reason— of Trump). Our vote is our voice in democracy, and it means what we want it to mean. It might not get us what we wanted it to get us, and it rarely does. But don't let anyone tell you that your vote is a waste.